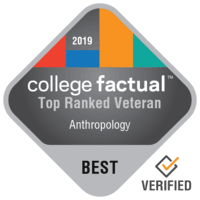 Santa Cruz, California – College Factual released its 2019 national and state rankings for Best Anthropology Programs for Veterans. University of California – Santa Cruz performed especially well in these rankings. UC Santa Cruz’s Anthropology program is ranked #23 out of 260 for veteran friendliness of all colleges and universities reviewed by College Factual. This puts UC Santa Cruz in the top 10% of all schools in the nation when it comes to offering a quality education to veterans studying Anthropology. UC Santa Cruz improved its ranking position 12 slots over the previous year’s ranking of #35. See the full ranking of Anthropology programs for veterans. University of California – Santa Cruz’s Anthropology program is ranked #5 out of 29 colleges and universities in California reviewed by College Factual for veteran friendliness. This puts UC Santa Cruz in the top 15% of all schools in the state when it comes to offering a quality education to veterans studying Anthropology. UC Santa Cruz improved its ranking position 1 slot over the previous year’s ranking of #6. See the full ranking of Best for Vets Anthropology programs in California. Based upon PayScale survey data*, a student who graduates from UC Santa Cruz with a degree in Anthropology realizes average early-career earnings of $39,282 and average mid-career earnings of $64,105. This is above the national average for all Anthropology graduates who make $35,412 in their early career. It is also higher the average graduate’s mid-career salary of $61,366. Learn more about majoring in Anthropology at UC Santa Cruz. University of California – Santa Cruz is located in a city setting, serving approximately 17,000 undergraduate students. Roughly 200 of these students are GI Bill® recipients. See all the ways that UC Santa Cruz is supporting veterans. Get notified when similar news about University of California - Santa Cruz happens.